Mini Kimochis are an ideal travel toy for young travellers. These award winning soft friends can help manage travel nerves, separation anxiety and other young emotions. Each 15 cm Mini Kimochis® character comes with a fun comic book and an emotional attachment (feeling keychain). Bella Rose comes with a Sensitive keychain and comic, Bella Rose Closes Up. 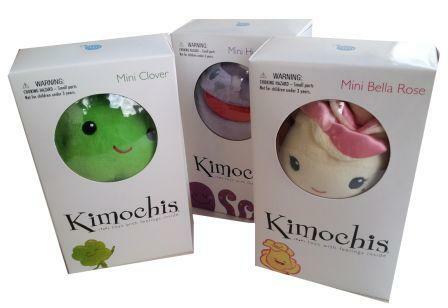 Kids will love collecting and expressing themselves with Mini Kimochis®! See"more details" section for FAQs, the Kimochis story and how to use the Mini Kimochis to manage child emotions at home and out and about. Children may be familiar with the Kimochis as they are being introduced to Australian schools. 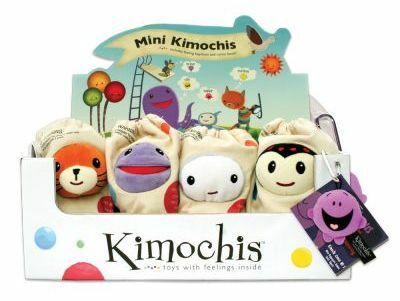 Kimochis® WINNER MOST INNOVATIVE TOY 2011 AND BEST EDUCATIONAL TOY 2010. Kimochis....Toys With Feelings Inside were designed and created in the US by Plushy Feely Corp.
Kimochi (KEY.MO.CHEE) means "feeling" in Japanese and Kimochis are what come inside each character. Mini Kimochis are small plush toys with a facial expression and an associated emotional attachment key chain. Using the characters and their Kimochis, kids can get in touch with their emotions through puppetry and play in a fun and comfortable way, building self-esteem and confidence one feeling at a time. Not only Kimochis adorable plush toys, but they are also an evergreen communication tool for parents, teachers, and children. Kimochis help children learn to identify and express their feelings and practice communicating feelings in positive ways. Using the Kimochis characters and feelings, kids can get in touch with their emotions in a fun and comfortable way. When kids can express themselves, they cultivate confidence, self-esteem and character. Bug is a caterpillar who is afraid of change and he can tuck his wings into a pocket in his back when he’s feeling particularly cautious. Cat is a little bossy and she sometimes needs to help heal hurt feelings. Cloud is a bit moody and unpredictable (his head even turns from happy to sad!). Lovey Dove is nurturing and calm and can sometimes worry. 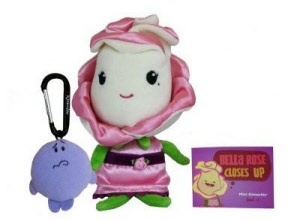 Bella Rose is sensitive and sweet. Clover, with his lucky ladybug Howard, is our four leafed clover with bad luck. What is included with the Mini Kimochis? The 15cm Mini Kimochis come in a peek-a-boo canvas pouch and include a feeling key chain and a comic book featuring that character. How can Kimochis be used? Kimochis are used in homes, classrooms, hospitals, private therapy practice and even with spouses! CONNECT with children by recognising and learning to anticipate situations that can trigger emotional - or Ki-motional - reactions. COMMUNICATE using positive words, gestures and signals that can help children know what to say and do when feelings arise. CREATE a comfortable environment for Ki-motional conversation and play. Put all the feelings in a basket or bowl on the kitchen table to spark play and mealtime conversation. Hide the feelings on pillows, in lunch boxes, or in drawers to send feeling messages. Make a point of calmly getting out the characters and feelings during emotional moments. Encourage kids to tuck the feeling they can relate to in the character’s pouch and tell you a story of what’s happening. Remember that all behavior (even the unpleasant kind) is communication. Use the Kimochis to help your child identify and express what’s really going on. Encourage children to tell their Kimochis character how they are feeling. Ask your child, How is Bug feeling today? Can he tell me why? What was the inspiration for the Kimochis? "There are very specific moments in one’s life when an event can change the way you look at the world," says founder, Nina Rappaport Rowan. "For me, that moment was the unthinkable and haunting Columbine High School incident. Why did this happen? What are we doing wrong? How can our children be so disconnected and self-destructive?" This was the inspiration that drove Nina to create Kimochis. "The goal is to get parents and kids talking to each other. Technology has redefined the meaning of 'staying connected.' In our fast-paced society, we have begun to lose the ability to connect with each other, and our children, on an emotional level. Our mission is to create original children’s products and family entertainment-compelling stories and lovable characters that will build confidence and self-esteem in our children. With Kimochis, we strive to help children develop the tools to become happy, healthy, and confident, and serve to strengthen parent-child connections. We plan to change the world, one feeling at a time."